Within Bridge Park, there are many different parking options available for those looking to walk around the newly developed area. Numerous on-street parking places have been added along with the Bridge Park development. Drivers should note that there is a two-hour limit for on-street parking on Longshore Street, Mooney Street, Bridge Park Avenue, Banker Drive and Tuller Ridge Drive. There are also several spots now marked as “designated loading zones.” These are necessary for suppliers to safely and efficiently make deliveries. This is a developer-owned garage. The fee is to help offset the cost of operating this garage, which is completely enclosed and more expensive to operate than the garages with free parking. There’s no question that a variety of transportation options are critical to the success of any mixed use, urban environment. 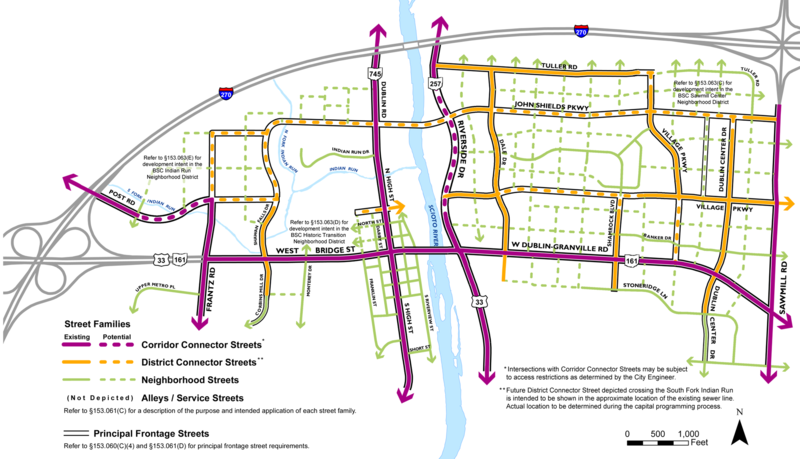 We’re looking at new street connections throughout the Bridge Street District and improving our current infrastructure, with new pedestrian and bicycle options on the horizon. 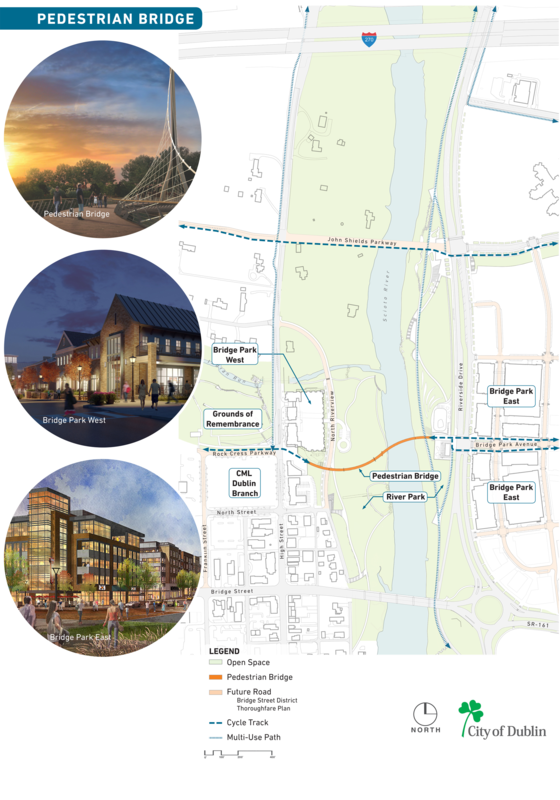 A “cycle track” will follow the pedestrian bridge and a future John Shields Parkway bridge to form a loop around Bridge Park and Historic Dublin. The track will combine the user experience of a separated path with the on-street infrastructure of a conventional bike lane. When the pedestrian bridge that spans the Scioto River in the heart of Dublin is built, it will serve as an important connection between Historic Dublin, the future riverfront parks, and all the commercial, retail and residential spaces on the east and west sides of the river. And it will be an iconic City of Dublin landmark, symbolic of the connectivity and inclusivity of our community. Sidewalks will accommodate pedestrian activity and outdoor seating. Sky bridges are planned to link two garages with neighboring buildings. Plans call for a pedestrian tunnel underneath Riverside Drive near John Shields Parkway. There will be crosswalks at traffic signals along Riverside Drive to help pedestrians safely cross. While providing the facilities necessary to make walking, bicycling and transit more attractive modes of transportation, the need for cars and the ability to conveniently park them is not going away. New streets will include on-street parking facilities in most areas, and as part of the discussions with various developers, we’re evaluating partnership opportunities for parking structures in a few locations and the use of podium parking to help address this need.